You can’t help when air quality plummets outdoors, but you can take control of the air inside your home by picking up any of the air purifier mentioned below. The festive season of Diwali is upon us and while fun and frolic is in the air, so is the harmful pollution that comes with the burning of firecrackers and if you dwell in northern parts of India, chaff burning. Air Purifiers are need of the hour, especially since the air pollution levels are soaring across the country. If one is really worried about the repercussions of breathing in toxic air that the winter air brings, then a good air purifier is a smart purchase that won’t give you buyers remorse. This article will help you pick a well-performing air purifier, which is tried and tested to hold its own, even when the air pollution levels break records. Meant for room sizes of 280 sq. ft., the unique feature in the 'i' models is the presence of an air quality sensor that speeds up the fans automatically whenever it detects a drop in the air quality of the room. Apart from that, the Classic 280i purifies the air using their patented HEPASilent technology. It has a smart panel on top to display Wi-Fi connectivity, fan speed status, filter status and the air quality of the room including PM 2.5 and VOC levels. The Blueair Friend app will let you control all the modes remotely without touching the purifier but it needs some work on Android phones. It can be purchased around Rs 30,000 and it can also monitor the air quality of your room in real-time and accordingly set the fan speed. You can read its review here. The Series 3000 AC3821 air purifier by Philips features a digital display to show you the current PM2.5 levels in the air. WIth a humidifying feature, it's helpful in increasing the humidity in the air by up to 60 percent for alleviating symptoms brought on due to allergies. The device can cover an area of up to 80 sq.m and has a CADR of 310 cubic meter/hour and humidification rate of 600ml/h. It is priced at Rs 34,000. Honeywell Air Touch S8 - Buy it here. The Air Touch S8 is capable of covering an area of 450 sq. ft. Although it supports app control, the buggy implementation of the app is a letdown. It’s better to control the air purifier from the device itself until there’s a software patch. Leave aside the app, the Air Touch S8 works out to be a decent air purifier to own. The air quality of the room is displayed using different coloured LEDs. If it falls, then the fan speeds regulate automatically just like the Blueair Classic 280i. The patented HiSiv filter is said to remove odours and toxic gases from the room. It also includes a pre-filter and a HEPA (high-efficiency particulate arresting) filter in its purification system. It costs around Rs 30,000. Packed with IoT features, voice commands, diffused air flow mode and more, the device is recommended for those who want a good-looking, feature-rich air purifier that performs well when the IAQ is in moderate to a slightly higher range. 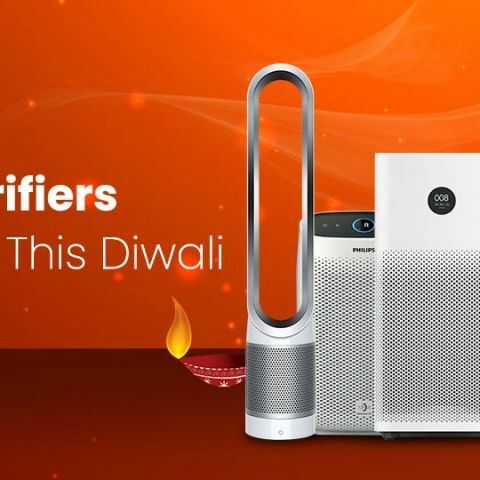 It features a sleek design, which sets it apart from most air purifiers of today. It also connects to the Dyson Link app, which doubles up as a remote and sports some additional features too. Equipped with a HEPA filter, which is constructed using glass borosilicate, it is capable of trapping particles as small as 0.1 microns. It has another filter made of activated carbon with Tris-coated graphite crystals that can trap harmful gases, household fumes, remove odour and formaldehyde. It is priced at Rs 44,490 and you can read the review of the Dyson Pure Cool here. One doesn’t need to buy exorbitant air purifiers for a small home. The Mi Air Purifier 2S performs well and can be used in a room of up to 350sq ft. It is priced at Rs 8,999 and is also IoT enabled so one can connect it with their Wi-Fi and turn it on beforehand. It can clean PM2.5, PM10 and Volatile Organic Compounds (VOCs). It has an OLED display on the front to help one ascertain how good or bad the air quality is. Sitting on the portable side of air purifiers, the Series 1000 is equipped with a lot of essential features. The air purifier is capable of removing PM2.5 pollutants using the combination of its Vitashield IPS and NanoProtect Pro (HEPA) Filter. Apart from particulate matter, it also removes harmful gases such as formaldehyde and a few total volatile organic compounds (TVOC). There’s a real-time air quality check onboard and in the auto-mode, the fans will speed up whenever there’s a drop in the air quality. The air purifier claims to even remove bacteria and viruses. It will cost you around Rs 9,000. Like regular mid-range air purifiers, the Aura has a HEPA filter that intercepts particulate matter from the air, and additionally, this filter apparently has an anti-bacterial coating. Another normal feature, the carbon filter will be able to take out bad odour from the room and cigarette smoke as well. The device isn’t huge, standing at about 500mm in height, it can take up a quiet corner of your room or office. It has a control panel on the top for various controls such as changing modes, setting fan speeds, and it also houses an indicator alarm when it’s time to change the filter. Along with the particulate matter meter shipped along with the purifier, the device has an inbuilt air quality monitor. Based on the quality displayed, you can either turn up or turn down the fan speed. The Kenu Aura will cost you around Rs 7,800.